Cheery Christmas songs blared through the orphanage, clashing with the background noise of hurried cleaning and howling wolves. The Christmas music I was used to. The orphanage had a total of five American Christmas CD’s that Ms. Melora, our orphanage director, had played constantly since they arrived free with a magazine subscription eight years ago. Those CD’s had been here as long as I had, and they sounded just as twitchy and nervous. The cleaning, I was also familiar with. When I, Faina Smith, turned eighteen last month, I should have left the orphanage and struck out into the fierce Siberian countryside on my own. I know, Smith? But one takes whatever name they give you, when one shows up as a ten-year-old amnesiac. Anyway, despite my age, Ms. Melora was loath to hire another girl to do my work when she could get my toil for free. The incessant howling of wolves…I’m afraid I was not as accustomed to that. Oh, sure, we had wolves. Deep in the misty forest, along remote stretches of the dark Lena river, behind the stone pinnacles that slashed the thick forested ridges. Siberia was deep within wolf territory. Most of the time the creatures stayed where they belonged. But these wolves were different. They lived in a vast, crumbling castle that crouched like a shadow on the edge of town. A bit of intermittent howling was normal, but something was different tonight. What? A castle in Siberia seems unlikely? Of course it is. Who in their right mind would build a castle in the far north? But that is the question, isn’t it? Was Kirill Volkov in his right mind? It’s hard to say. The man did own wolves, after all. Perhaps he felt he must live up to his name. Volk meant wolf in Russian. Whatever had caused his extreme fascination with the origins of their family name, Kirill Volkov hadn’t built the castle. It wasn’t built here at all, only moved, and it was his father who’d moved it. I took a cloth and wiped down the face of every child in the room. They were none too happy with me, but cleanliness was vital today, and so I persisted. After struggling to wipe the breakfast off eight squirmy babies, I paused in my work, drawn by the deep throaty song of the wolves. I peeked out the frost-streaked window. It was late afternoon on January sixth, Christmas Eve. The village was lit with a fading, dusky light. A bitter wind kicked up a few small tornados in the snow, blowing them through the market. Wood smoke curled out of every chimney as each village family prepared the meatless feast that would break their Christmas Eve fast. When the first star appeared on the horizon, the birth of Christ would be celebrated with sweet smelling hay scattered on the floor, glowing white candles on the table, and twelve traditional dishes, representing the twelve apostles. The Volkovs’ castle seemed separate from all of this. It rose out of the gloom of the forest, not quite in town but not far enough away to be forgotten. It clashed with the quiet ambiance of the small village of Zamok Drakona. The name meant Dragon’s Castle or more precisely “The Lock of the Dragon.” I’m sure the village had a different name once. But when Kirill Volkov’s father was inexplicably gifted a gargantuan castle from the Ukraine and had the whole thing shipped to Siberia block by block, what else could they call the place? He had a wall of river rock built around his new home, but apparently ran out of resources at that point. No further improvements were made after that. The castle sat, long and gray and dark, at the edge of town. Three stories of rain-streaked stone topped by a black slate roof. Row after row of leaded glass windows glared out into the Siberian gloom. Only one or two of them ever showed a glimmer of light. It had remained exactly the same for the past eighty years. Eventually, the first old eccentric had died, leaving the monstrosity to his equally eccentric son. Our new hermit did little to improve the place, but he did bring in some pets. Kirill Volkov hired some men from the village to build an immense cage that stretched across the castle grounds. Then he acquired his very own pack of Eurasian wolves. These critters were well cared for and large. In the wild, Eurasian wolves top the scales at about 100 pounds, although there were always exceptions. I’d heard whispers that some of Volkov’s pets weighed in at the upper limit for their species, 160 to 170lbs. Eurasian wolves are definitely not recommended for the first time pet owner. But Volkov had gotten away with it so far. Why I used phrases like “first-time pet owner” and thought in pounds and inches rather than kilos and centimeters, I had no idea. My vocabulary was a personal peculiarity. Words and phrases I’d never heard spoken aloud in Russian filled up my mind. Perhaps the smack to the head that had taken my memory was at fault. But regardless of my mental glitches, the wolves were usually much less vocal. Had old Kirill Volkov left his nephew to feed them again? That had not gone well. Vladim Volkov hadn’t fed them at all. He’d tried the first night, but wolves demand strength and according to rumor, fear had wafted off that young man like stink off a week-old fish. After the first bite, he left them to starve. Their low angry howls had surely kept him awake every night until his uncle returned. 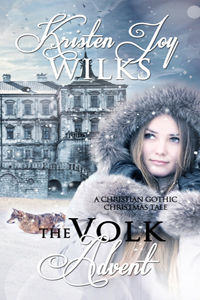 Kirill Volkov hadn’t left the castle since, as far as I knew. He would never forget to feed them. I mean how could he? They were incredibly loud. And wasn’t his niece at the castle right now, decorating for her big Christmas gala? Surely even a city girl would notice that something was up with her uncle’s menagerie. The wolves continued to howl. The American Christmas music continued to blare. I yanked my attention away from the window and jogged to the older babies’ room. Ms. Melora had a guest coming, and she would be around to inspect soon. The children in the next room were toddlers. None of the little ones wore diapers. Instead they cruised back and forth in a large communal pen, wide-eyed in their threadbare nightshirts and silent. But something extraordinary happened when I bustled into the room. Those serious little faces broke into grins and a few brave souls even clapped and reached for me. This never would have happened my first year here, but I held a dark secret close to my heart. I had defied Ms. Melora and my risk was bearing fruit. Don’t ask me why I thought they needed to be rocked. No one else ever did it. But somehow these tight gray rooms, packed with children rocking themselves back and forth in lonely silence had seemed so wrong. I couldn’t remember anything of what I had once been. But something within me shuddered at the sight. So, yes, I wiped messy bottoms as I zipped through the toddler room. Yes, I dusted the windowsill and swept. Yes, I cleaned the mess off the floor where babies had missed as Ms. Melora and her assistants rushed them to the small bathroom to sit on the pot. Diapers were a luxury, she preferred to zip them in to the toilet and just clean up the mistakes. But I also kissed downy heads and sang silly songs. I pulled them into my arms and danced them around the room when I was certain no one would see. Thank goodness for the cheesy Christmas tunes, or my misdeeds would have long sense been discovered. The strange sounds of giggling and joyful coos were a dead giveaway. Everyone here was forgotten. Forgotten by family and friend and perhaps by the eye of Heaven itself. But I could see them. Though I counted myself forgotten as well, I would not forget. I had just finished dusting and was taking a spin around the room with one of my most successful cases. Setinyi was a laughing little girl with the wide brown cheeks and dark almond eyes of a native Yakut. She had come here very young. I had been her caregiver from the beginning. Usually, I danced with babies in the dead of night when Ms. Melora’s many sips of vodka had taken her deep into the land of dreams. But I felt emboldened by my success, by the eager reaching arms and brightened eyes of the children in their pen. I danced with Setinyi in the middle of the day, when I should have been scrubbing floors. With my heart beating full and strong, I danced to the terrible crooning of Christmas tunes gone awry. I danced far too long. The sound of clapping brought me to a standstill. It was not the clapping of a happy toddler or the clapping of a pleased audience at a concert. It was the slow sarcastic sound of hands smacked together in mockery. I didn’t even need to turn. I knew who stood behind me. ‘Holly Jolly Christmas’ echoed through the halls, competing with the whoosh of the overworked heating system. I resisted the urge to make up a verse more appropriate to my situation. It’s a stinky silent orphanage, and Ms. Melora’s on the prowl. Hide your smiles and use your wiles, if you’ll avoid her scowl… No, I needed to concentrate on some grand and fabulous plan or I was toast. Nothing presented itself. I turned and faced the orphanage director. Ms. Melora wasn’t scowling. She was smiling. A chill oozed across my shoulders and down my back, like the cold, lumpy kefir we fed the children instead of formula. I had never seen Ms. Melora smile. I set Setinyi back in the pen with the other toddlers and smiled back. “So you are why the babies cry.” Her pale blue eyes met mine and I swallowed, unable to continue my clever ruse. The hall echoed with the tinny strains of ‘Rudolf the Red-nosed Reindeer.’ I stared back at her. I raised my hand. “I said exactly what I mean. Now, get the floor cleaned in the older ones’ room before our guest arrives.” Ms. Melora straightened from where she leaned against the doorframe and left the room as silently as she had come. I stood in the center of the room, numb. I glanced at Setinyi where she toddled about the communal pen. Not rock the babies? I would never survive such a heartless prison. How could these tender little ones endure? No, Ms. Melora would have to actually pay whoever took my place. She couldn’t afford to do it. I had room to bargain here. If I did every little thing exactly how she liked, perhaps she would relent? Forget to bolt my door, something? I had to try. The little ones had no tender touch in their lives but mine. Surely, my work held value in Ms. Melora’s eyes. But was I valuable enough to offset an orphanage full of babies who knew enough to cry? I gave Setinyi a quick kiss on the top of her head and rushed to the next room. I would never find out if I didn’t get it clean. If I could show her exactly how hard I worked, Ms. Melora might forget about the deadbolt and turn a blind eye to my compassion. I just had to make sure that everything was perfect for her guest.